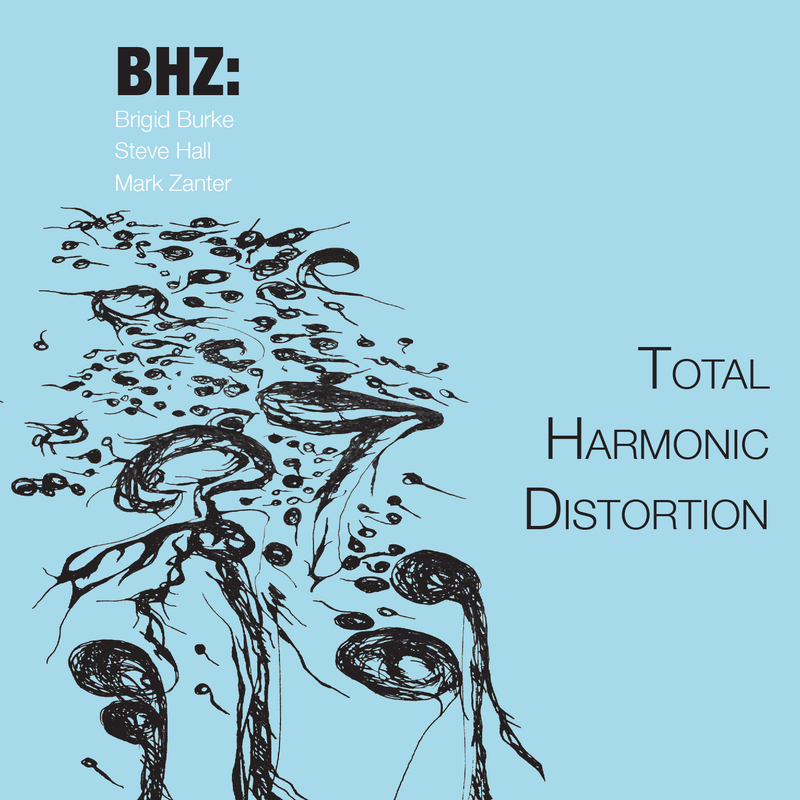 Total Harmonic Distortion features the combined talents of Australian clarinetist, composer, artist Brigid Burke, and Americans Steve Hall, percussion, and composer, guitarist Mark Zanter; three improvisers whose work is edgy, sophisticated, listenable. The genesis of BHZ occurred during Dan Senn’s EchoFluxx 14 festival in Prague, Czech Republic where Brigid and Mark presented individual sets, and performed as part of the EchoFluxx ensemble. Then in early 2015 Steve Hall joined Mark and Brigid during her residency in the U.S. under the Edward’s Distinguished Professor of the Arts Program at Marshall University. The group toured with dancer, choreographer Jessica Lynn Fox with a show featuring improvisation, live video, and works that were to become tracks on the album. Total Harmonic Distortion is a record of that short but intense work period in April 2015. The album features six works including Burke's Gloss (2013), Zanter's Stretching G (2014), and four improvisations by Burke, Hall, and Zanter (BHZ) recorded at Marshall University, Huntington, West Virginia. Improvisations on the record demonstrate the group’s ability to play, respond, and create. Pop and the title track, Total Harmonic Distortion feature the musicians as equals, each inhabiting their own unique musical space, while the hauntingly beautiful Flaming Radio, and Silent Endeavors feature Burke and Hall’s interplay over Zanter’s glitchy jabs, and eerie drones. Stretching G (2014) is a work for electric guitar, live electronics, clarinet, and percussion. During performance recorded segments of the guitar track are continuously edited and stretched while other instruments improvise sweeping sounds and add dynamic and color contrast. The work was influenced by Ry Cooder's work on Wender's film, Paris Texas; it invokes the sense of a dry, arid landscape. Burke's Gloss (2013) features a video score that performers improvise with during performance. This version also features an electronic part composed by Brigid. This performance demonstrates Steve's amazing ability to respond and react musically. The music of Gloss was inspired by a series of nine pen and ink drawings, which were used as graphic notation for the different instrumental combinations and live electronics. The nine graphics were then integrated into the video art work that shows glimpses of the graphics in superimposed layers in conjunction with pencil drawings of squiggles depicting wire. These were then photographed. The depiction of wire glosses the image with a superficial lustre. This finished rendition of the Gloss video was used as a score for this recording. Brigid Burke is an Australian composer, performance artist, clarinetist, visual artist, video artist, and educator whose creative output fuses her multi-disciplinary skills into media performances and installations of exceptional aural and visual nuance. Her work is widely presented on concerts, festivals, and radio broadcasts throughout Australia, Asia, Europe, and the U.S.A. Dr. Burke has earned degrees from the University of Tasmania, and the University of Melbourne. Steve Hall, percussionist/drummer performs with top touring artists in the U.S. including Aretha Franklin, Blood, Sweat and Tears, Melissa Manchester and a host of others. As a concert artist he appears regularly with the Huntington Symphony and Ohio Valley Orchestras, and has recorded with the contemporary chamber group, Triptych. Steven Hall is Professor of music at Marshall University, and currently endorses REMO Percussion and Vic Firth products. Mark Zanter, composer/performer, has received commissions from many artists in the U.S. and abroad. His compositions have been featured on radio broadcasts, concerts, and festivals in the U.S.A., Brazil, and Europe. Dr Zanter has received awards from ASCAP, AMC, ACF, Meet the Composer, WV Division Culture, WVMTA; and Lament and dream for string orchestra, piano and percussion received special distinction for the ASCAP Rudolph Nissim Prize. He currently serves as professor of music at Marshall University.